The gist: Year-to-date sales in Lafayette Parish approached $5.5 billion through November 2018, according to a release from LEDA, on pace to surpass $6 billion. That puts local commerce in shouting distance of 2014’s $6.4 billion peak with a month of reports to go. Total taxable sales in the parish were up 4.4 percent from 2017 and 5.6 percent from 2016 in that time period. But the city’s lagging behind: The city of Lafayette performed the worst among municipalities, up only 1.4 percent, compared with 28.2 percent in Duson, 19.3 percent in Youngsville, 17.3 percent in Scott, and 9.2 percent in Carencro. Even unincorporated Lafayette Parish beat the city with a 3.7 percent uptick. More than 70 percent of the total retail sales in the parish happen in the city of Lafayette. It’s still the region’s shopping anchor. In the city, apparel, general merchandise and building material sales are all down from last year. LEDA CEO Gregg Gothreaux says that’s in part due to belt-tightening and a correction from flood-related boosts in construction. Up but still down: While the parish’s performance might be up from last year, sales through November were off more than $300 million from 2014. The cities of Lafayette and Broussard and the unincorporated parts of the parish are all down more than $100 million each from where they were back then. Up and up and up: But some parts of the parish have seen a steady rise in retail sales despite the economic downturn in the parish the last few years. Youngsville‘s up about $60 million since 2014, Scott about $40 million and Carencro more than $50 million. Duson‘s all over the place: If you compare 2018 to 2014, Duson’s down about $1 million. But if you compare it to 2013, it’s up almost $11 million. But then if you compare it to 2012, it’s down more than $24 million. What’s going on in Duson? More sales = more revenue for government, but in a good way: When total taxable sales go up, so too do sales tax revenues for schools, city governments, and economic development districts. That means more money for government without having to raise taxes. Modest increases in sales tax receipts in the unincorporated area helped patch a temporary budget hole when a plan to sell a parish-owned parking garage to the city fell through. 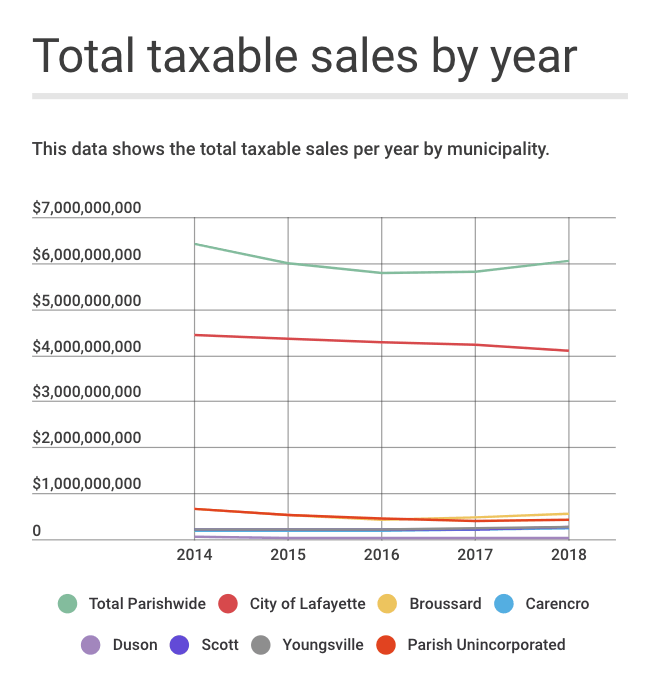 Unincorporated Lafayette parish has been routinely raided of its sales tax revenue through annexations by nearby towns and cities. Good news, but … Rising retail sales is an indisputably good thing. But Lafayette still has a ways to grow to recover lost ground. So while we celebrate finally getting some good economic news, let’s not forget that this just suggests the bleeding has stopped. There is still a lot of healing left to do. ▸ The gist: Dyer announced Tuesday that he will officially leave DDA this August to take a private sector job in Calgary, Canada. DDA will also fill three board vacancies at that time. The gist: Annual estimates from the U.S. Census Bureau show across-the-board declines in growth speed, and shrinking populations, in and around Lafayette from 2016-2017. Council is figuring out its new superpower on tax exemptions. That gives economic developers the jitters. 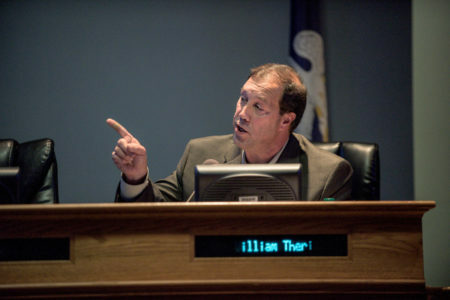 The gist: The City-Parish Council rejected two property tax exemptions Tuesday night, including one for Stuller Inc. That racks up four defeats since local agencies gained a say in a state tax incentive program that economic developers believe is an essential tool for business recruitment and retention.